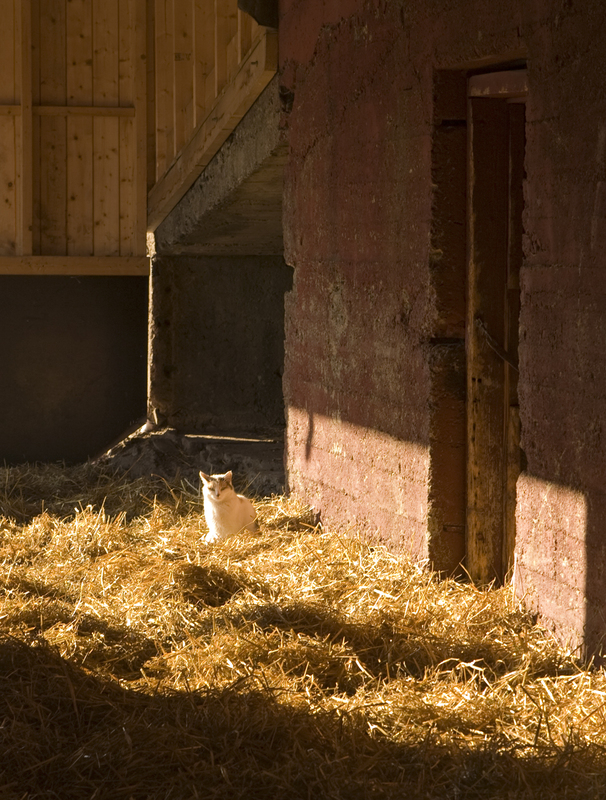 The Cat At The Stables. It’s still pretty cold here. Yesterday my daughter pointed out this cat to me. 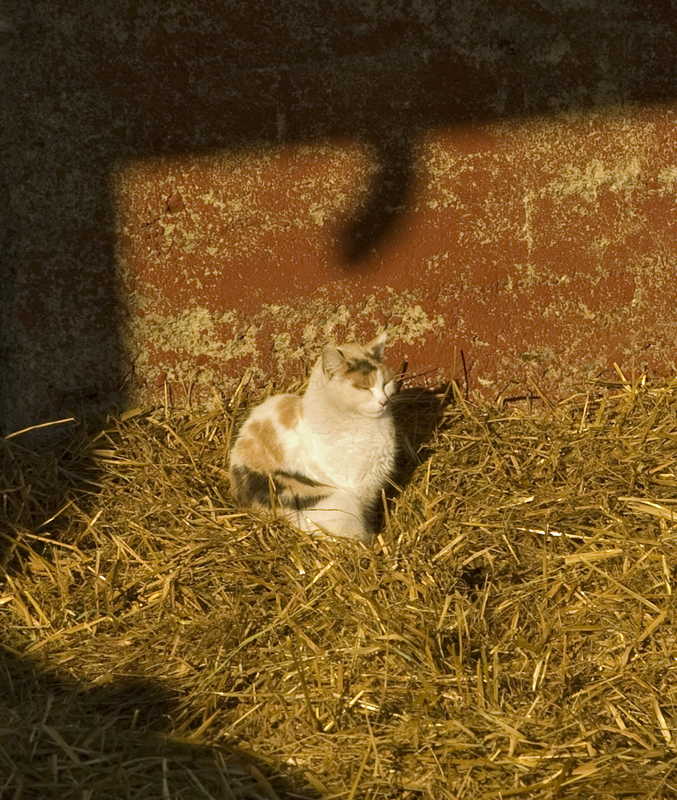 She’d found a sheltered spot away from the snow to sit on the straw and enjoy the sunshine. Occasionally a horse galloped through. The cat didn’t leave, though she retreated. You can just see (below) that she’s living in a hole in the wall, to the right of the horse (our right). And then the cat came back. Cats are so considerate (as well as clever) about these things — picking a warm (colour) spot, to please a photo-bug. Thanks. That’s true, it does. I’m cold too. Very nice moggy that. Crown, will you allow me to satisfy my curiosity as to which countries have access to the BBC iPlayer? Could people say whether clicking on this link in the next few days works for them? Goodness. I was ready to say immediately that it doesn’t work but then I tried it and it does! What does this mean? Can I listen to the Home Service all day long? “Can I listen to the Home Service all day long?” Only if you also click the iTimetraveller. Anyway, one goal to Norway. I read that the BBC has done a survey and they are going to turn the Home Service into a sort of light version of Radio 2, so it will be more appealing to ethnic minorities and the young at heart. I thought that was very considerate of them. Yes! A cat at Crown estates! Tom and his “someone” are right, the photo makes you feel warm. Not at Crown estates. It’s half way down the hill on the way to the fjord. 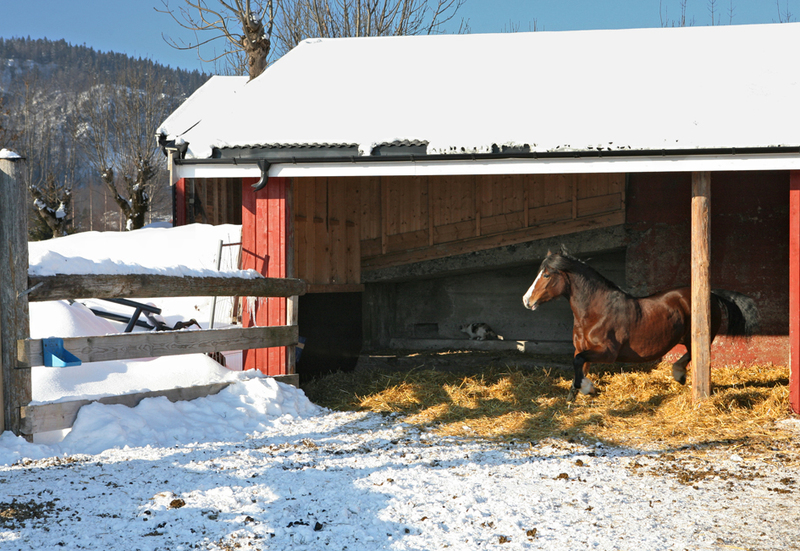 It’s where the horses spend winter (with lots of other horses). Disillusion after disillusion. A sombre day indeed, today. dearieme, from here in Canada the talk and music are loud and clear. Too bad we can only see a single shot of, I presume, the narrator, instead of an actual performance by the musicians. I think it’s BBC radio, m-l. That’s hard even with today’s technology. Norway, Argentina and Canada: impressive. Anyway, as I understand it, programmes are available on iplayer for a week after they were broadcast. You can get telly programmes too (at least you can in the UK). I don’t understand High Finance, but this sounds just up your street, Crown. I too can listen to the radio link here in Belgium. It’s the TV iplayer I can’t get. I don’t understand that they don’t work out a model where they would make it avalable to foreign viewers for a fee. Presumably, that might mean that they would have to reduce their prices when selling their programmes to foreign broadcasters, but wouldn’t the increased revenue more than make up for that? People might want to watch all kinds of things that are now not even being sold to their countries. Also, they wouldn’t be so tempted to watch or download these programmes via other sites. I don’t understand that they don’t work out a model where they would make it available to foreign viewers for a fee. They do! It’s just that it’s called a VPN and the fee isn’t payable to them as such. Des, please tell me more. I too have speculated on goat poo and its uses. I never thought of using a cherry picker, that’s a waste of time, but I have considered marketing the stuff. Pound for pound goats probably produce more poo than wool. I don’t really understand the metaphor here, though. Have these people ever seen goat droppings? They look like coffee beans (the droppings). We’ll have to look up VPN, Bruessel. The thing I don’t understand is why the BBC & OUP put up paywalls around everything. The billionaires at google and facebook give the product away and make their money in advertising. Even Jimmy Wales is rich and Wikipedia doesn’t even have advertising. The BBC is said to be run by accountants, you’d think they could at least make a profit. After the Jelly Roll Morton music, I listened last night to some Beethoven piano music on Radio 3 on the iplayer. Limpid beauty. That’s the thing with commenting on blogs: I can type in words I’ve never typed before. Limpet, I’d typed before; limpid never. I don’t think I’ve even typed limpet. I’ve only hand-written it up to now. Have you ever tried limpet soup? It’s foul. Which is probably the occasion of my having typed limpet. That is a brave cat indeed. Pluck of that sort should be applauded. Our pack of cats were all wild survivors, once. 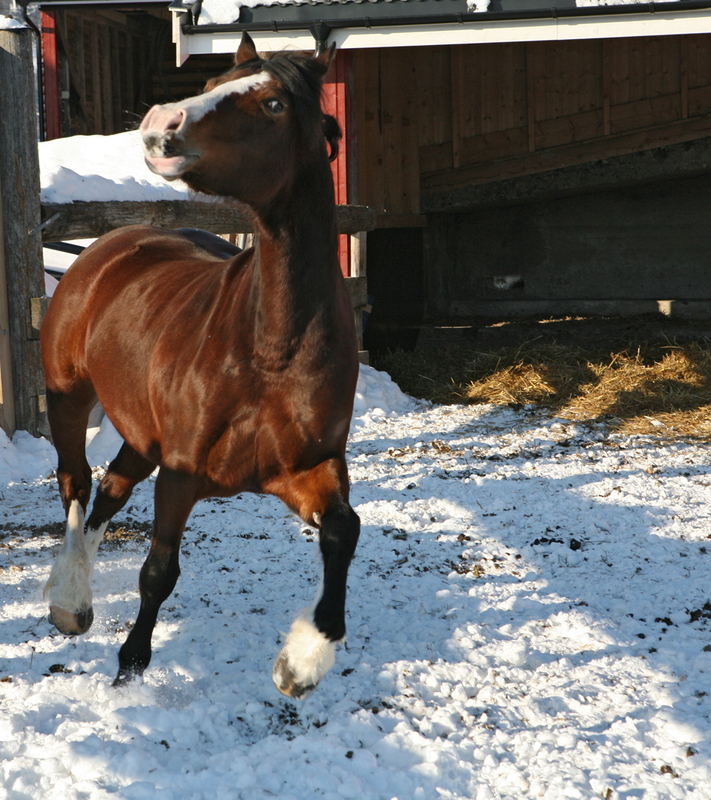 Two of the three in the current lot seem perfectly happy to have left the romance of cold wet starvation well behind. A third continues to enjoy both worlds. A fourth pays repeated nocturnal visits and will seemingly endure any foul weather in order to secure a feeding. Expat colleagues of mine use them extensively and are very satisfied. I don’t, because I don’t currently have time to relish the possibilities. (And I have the four(4) main BBC channels in my local cable package anyway.) Legally it is at best a bit of a grey area, if that bothers you. Thank you very much, Des. I’ll investigate. I’m very glad you’re doing that Tom, and I’m sure they are too. Did I tell you about my great-great aunt who had nineteen (19) stray cats? I’m not trying limpet soup. Well, maybe I’d try it if someone offered me some, but they never will. “Limpid” always makes me think of “turbid”. “Turbid” and “turgid” are similar enough that I would have to think twice before using either one. In describing prose, “limpid” and “turgid” are more or less antonyms. In describing rivers, “limpid” and “turbid” are more or less antonyms. In his Just So Stories Kipling describes the Amazon as turbid. He does not say whether the grey-green greasy Limpopo is limpid, but it seems unlikely. I think that the poor young jaguar on the banks of the Amazon would understand my feelings about these words. Yes, Artur, I fear your great-great-aunt’s and our common cat-dottiness is one of those déja-vu-all-over-agains… apologies for the geriatric recursion. Our house is cold and draughty, so the cats’ principal ruse, when it comes to strategies for keeping warm (which is, whenever you are not eating), is to attach themselves to the body of a person. Preferably an immobile person; but if one of those is not available, a moving person, temporarily immobilized for these purposes, will do. Someone here refers to them, therefore, not infrequently, as “limpets”. Talking of jaguars…coincidentally, one year ago today, I posted this one, gave it no particular thought at the time (sad admission, but there it is, it’s obviously an ephemeral medium, & c.), and was greatly surprised to find, over time, that thousands of people were looking at it (without, by the way, ever saying a word). It was concluded by someone that there is a mystic jaguar cult somewhere that was using this post as a sort of home page (?). Spooked one a bit to consider that… but what is it they say? That’s entertainment? Tom, there are a couple of posts on this blog that keep appearing in my “history” even though I never look at them: one is called Magritte? You Must Be Joking and the other is Pictures (& Now, More Pictures) Of Mab’s Dacha. Could it be that your Jaguar post is simply a way computers remember the way to your blog? That’s what I’m guessing about mine. Now, of course, there are going to be lots more people going to your jag post. Have you been to Tikal? I have! It is fantastic. Our Yorkshire terrier is a limpet for the same reason your cats are. Ø: “Turbid” and “turgid” are similar enough that I would have to think twice before using either one. This kind of thing is one of life’s problems (2nd Division). I’m glad it’s not just mine. Thanks for the explanation, Des. But what I would really like is the BBC and ITV making their broadcasts available for a small fee to users anywhere in the world, similar to how ITunes works for music. The German broadcasters ARD and ZDF as well as the Franco-German Arte even let you watch quite a few of their things on the computer free of charge, if it’s possible for them, surely it must be possible for others? Yes, Dearie, the iPlayer works here (that is rural Catalonia; so it probably works in all of Spain). It doesn’t look familiar to me, though; which is odd, because it must be by some other means that I listen to Radio 4 for long stretches via computer whenever I remember to. But now I have to go back and finish listening. Wonderful cats, today – domestic and otherwise. It seems like only moments since I last looked but two posts have appeared. How does it happen? No wonder I am frightened of actually blogging! Another yes, Dearie, for the iPlayer working here at Stanford, CA. Where we also use goat poo to make compost tea—-for the garden. Hmmm… it looks so good in the sun. One of the things I love with a cold winter day is when there is so good sunlight to warm your bones. That’s of course when you don’t have a stupid horse charging at you. Arthur, it seems a few things have disappeared from your blog. You remember the story about Mrs Crown’s “musky toes”? I can’t find it anywhere around. But how did we come to speak of internet access on a post about cats and horses and sunshine on cold days? …Ok, here it is: Foot Problem. Very interesting to hear from you. This is a case of life imitating art; five or more years ago I wrote a long story about someone who sells dried goat droppings wrapped up as teabags. Can you tell us more about your goats?